A Mandragora that had spores stuck on it and as a result, sprouted a mushroom. 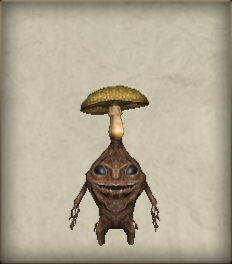 The mushrooms are very hallucinogenic. They are easily grown and the mushrooms are mixed with herbs to relieve pain and cure other illnesses. They are also mixed in the poisoned bait used by hunters.